The Cosmos Fields Shawl pattern has been written with my "novice" readers in mind - (with more detailed explanations on how to get from row to row etc). This is a fun project for any skill level though - super to take along on holiday (I just did) or for in front of the telly! The pattern is designed to be worked in a 100% acrylic "economy" DK (8ply / light worsted weight) yarn, but it works up quite wonderfully in a more luxurious yarn! 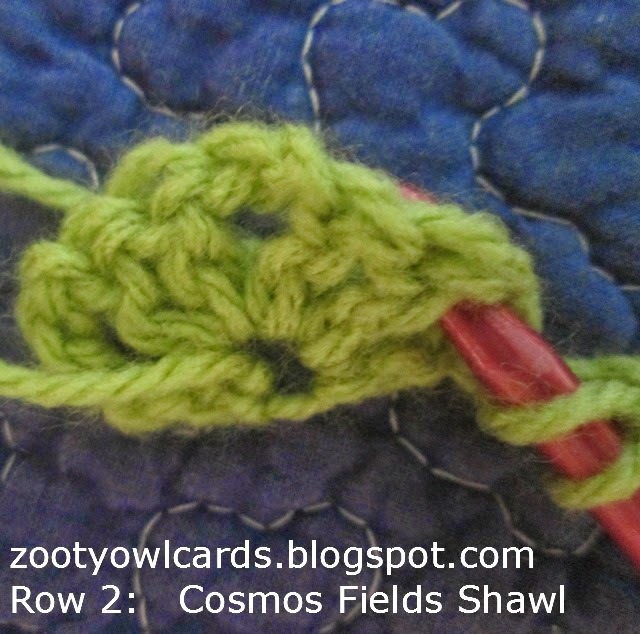 The stitch composition is very uncomplicated - making the pattern suitable for both variegated and solid colour yarns! Various yarn blends also work well with this pattern – Courtelle, 100% wool, acrylic/wool blends and cottons. 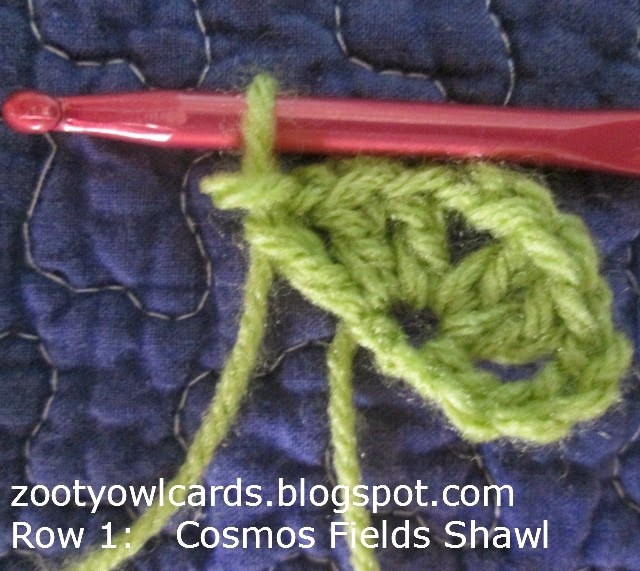 Thinner yarns may be used – just keep repeating the pattern row (Row 3) until you reach the required size. Always make sure you end on an odd number of rows before starting your edging! Thicker yarns may also be used, such as chunky (12 - 14ply) or super chunky (14 - 16ply). Side Increases are made at the beginning AND end of every row. The increase of 2dc at the beginning of a row is made into the 1ch space at the end of the previous row. The Point (or corner) is formed in your very first row (2dc, 3ch, 2dc). If your increases are correct you WILL have a perfect triangle. If the triangle pulls outward - you are increasing too much. If the triangle pulls inward (like a kite) you are increasing too little. 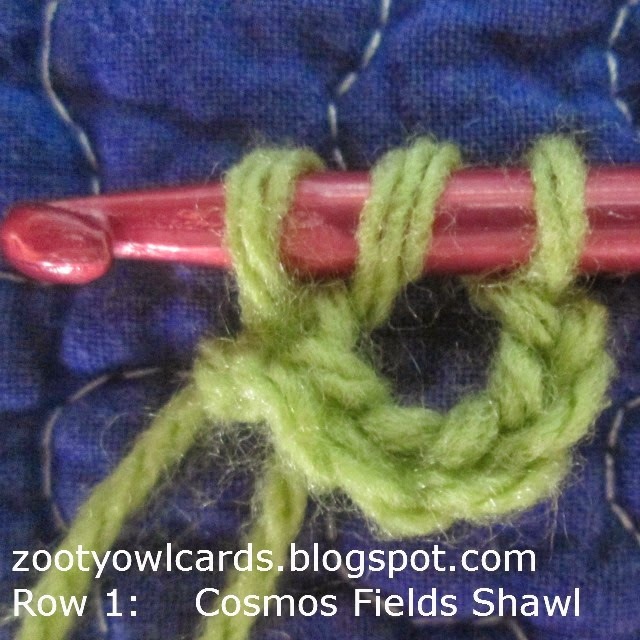 An easy "check" is to count your stitches - each row should increase with a multiple of six: Row 1 = 6; Row 2 = 12; Row 3 = 18; Row 4 = 24; Row 5 = 30 and so on. Once you have the first few rows correct you probably won't need to count any more. Triangle: The shawl is worked seamlessly (in one piece) from the top to the bottom - your first row being the top of the shawl which will lie behind your neck and the last row being the bottom which will hang down over your back. UK CROCHETERS will be using a double crochet (dc) (single crochet in US); half treble (htr) (half double crochet in US) and a treble (tr) (double crochet in US). [3ch, skip 2 spaces between dc (this means you will skip 3dc posts) 1hdc into the 3rd space] repeat this until there are 3dc posts left at the end of the row; 2hdc, 1ch, 1hdc into the chain space at the end of the row. 2hdc, 1ch, 1hdc into the chain space at the end of the row. (3ch, 1sc into next sp, 3ch, 2dc into next sp) repeat to last sp; 3ch, 2dc into 1ch space at end of row. sl st into side of first dc post, (2ch, 1hdc, sl st into side of next dc post) repeat to last dc post, 3hdc, sl st into top of 3ch at start of row to end. What type of yarn is this equal to in Ohio? In the US the equivalent would be a light worsted weight yarn, but a medium worsted weight would also work well! Great pattern, many thanks for posting. Roughly how much yarn would be used if done in a single random yarn do you estimate? Just thinking it would be easier yo pack for a trip with a single ball or two! looks lovely - I must try this!! Thank you for the pattern. I love it, your shawl is gorgeous! Very pretty. Thanks for the tutorial. Yes it is Lorraine. I will draft up a post for the colours of the Neon Wrap later today! 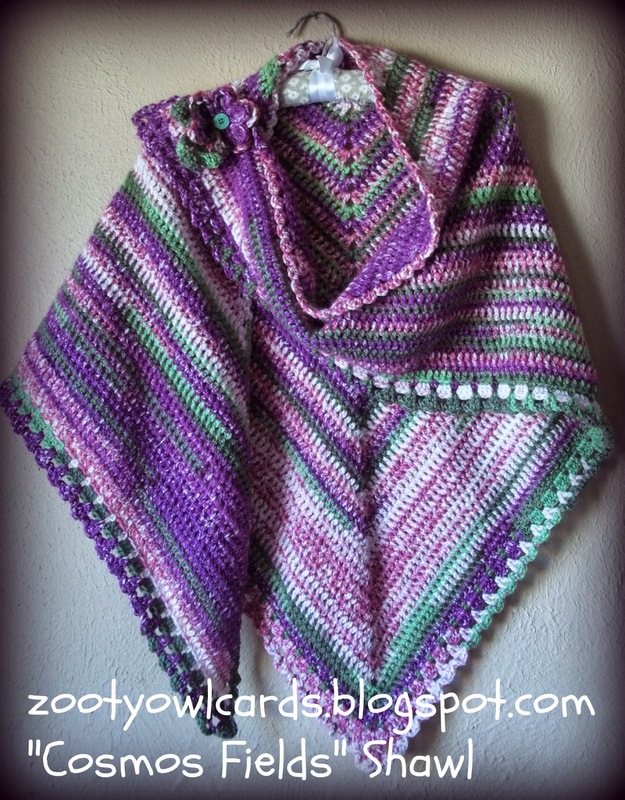 After crocheting 3 Road Trip Scarfs, I certainly will try this one. It's gorgeous! Thanks, Zelna! Hi Jolande! Please post photos on my Zooty Owl Facebook page - I have made an album for the RTS! Another Zootyowlcards.blogspot.com Gorgeous design! I'm in love! I just hope I can do it:) Thank you so for sharing your gift with us. Beautiful design and very well written pattern. So my yarn is in square yards so do you know a a ballpark yardage please. Hi Lori! Yardage would be about 1650 yards. Beautiful! I am going to add it to my queue! Thank you for the free pattern and clear instructions! Oh that looks so lovely! Thank you for the free tutorial! I have some cotton-merino yarn - I reckon this might be perfect for the pattern! That would be gorgeous Anne! Please post a photo on my Zooty Owl Facebook page when you have made one!! Thank you! This is just gorgeous! I thought I posted but did not see it, so here goes again. What size would this pattern fit, would it fit 2XL? IF not how would it be adjusted? Would worsted make it larger? (I imagine it would.) Do you know a USA equivalent that has the colors in worsted weight acrylic? Thanks! I am a medium to large - you would have to make it a fair bit bigger to fit 2xl. Worsted weight and a 6.50mm hook should make it quite a bit larger without increasing the number of rows. (If you still want it bigger when you have reached Row 55 just keep repeating Row 3 until it is a few rows short of the required size (taking into consideration that you will still be adding the border). I would think that Red Heart Super Saver would have close to these colours! Una belleza!!!!! Gracias por compartir!!! What are the final measurements of this piece? Thank you, that is extremely helpful. I just really want to get started and see if I can make it! You are my role-model!! I found some great yarn in the RHSS. Before I start, I bet I need to rewrite the instructions in USA terms, correct? Where it says dc, I would sc, etc.? Thanks! RHSS will work brilliantly! My patterns are all written in USA terms so you won't have to do any conversion! This looks like the same pattern as the RTS, except for number of rows and the trim rows. Is this true? BTW, I love your designs. You are very talented. Hi Marge - my final measurement was 1m long and 2m wide. Thank you for sharing this wonderful pattern with us. The colors you have chosen sing to me. I have just discovered your "road trip" scarf pattern on Ravelry & am definitely going to crochet it. Love the colours you use. My shaw measures 33" long down the back and 33" across the top between the 2 points. I don't want the back any longer, but I do want more for my arms to be covered. Any idea how I can do this. I have crocheted 41 rows so far. Help! I am so grateful for all the hard work you are constantly putting into your patterns and turorials that you share with us so generously You really did an amazing thing, listing the colors and their order, in this AND.the neon shawl, as I too plan to use it as an everyday accessory and the colors go so well with who I am, and how I dress in daily life. Thank you so much! I truly needed that. Buen día. Es precioso. Me puede decir si quedaría bien con algodon. I have almost finished this shawl and it is coming out beautifully. I did use Bernat Stripes a variegated yarn since I didn't want to keep changing colors and it looks good. Not sure if I want to continue with the variegated for the border or use a solid but I'll see how it goes. Very nice pattern and yes it is an easy pattern for a beginner and even someone like me who has years of experience.